The Federation of Multiple Sclerosis Therapy Centres provide hyperbaric oxygenation (HBO) for the treatment of Multiple Sclerosis. 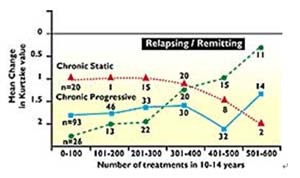 This report follows the progress of many patients since they started treatment over 10 years previously. The Federation acknowledges the advice, guidance and support of its Medical Advisors on Hyperbaric Medicine, Dr David Perrins, MD., FRCS and Dr Philip James, PhD., FFOM and this long-term study on the effect of hyperbaric oxygenation on the course of MS. THE EXPERIENCE OF THE FEDERATION IN TREATING MS WITH PROLONGED COURSES OF HYPERBARIC OXYGENATION. Multiple sclerosis is a disease of the nervous system that results in localised patches of inflammation in the brain and spinal cord which may eventually scar (sclerosis). The affected areas are unable to accept sufficient oxygen from the blood stream unless more is dissolved in the blood. In 1983 the New England Journal of Medicine reported a controlled, double-blind study on the effect of hyperbaric oxygenation on the symptoms of multiple sclerosis. It scientifically demonstrated benefits (p c 0.0001) but recognised the need for long-term studies. After a pilot study had confirmed this report, patients and their relatives installed pressure chambers in 56 Centres throughout the UK. Since 1982 over 12,000 patients have received HBO treatment. In most, an initial intensive course has been followed by intermittent maintenance treatment. Well over a million individual sessions have been completed without untoward incident. It is difficult to assess the effect of any treatment on MS patients because of the unpredictable fluctuation of signs and symptoms. One authority considers that the best experimental design is to observe a large number of patients treated over a period of time. The Federation therefore followed the progress of 703 patients who had first received treatment soon after the centres opened. They were recruited from those attending 28 of the Centres. Their details are given in Table 1. They had been told that they had multiple sclerosis by neurologists who had said that there is no effective treatment for their condition. The co-operation of the patient's family doctor had been obtained before they were accepted for treatment. The patients breathed oxygen from a face mask in a chamber compressed with air. The initial course of treatment consisted of twenty sessions in 4 weeks. Thereafter the patients returned for a 'follow-on ' treatment on a weekly basis, or failing that, as often as they felt the need or found it possible. They were interviewed and assessed immediately before, during and immediately after the initial course. Patients were classified as Relapsing/Remitting, Chronic Progressive or Chronic Static and assigned a Kurtzke Disability value from a scale (KDS) that enables patients from different Centres to be compared. Between two and four years, and again between six and eight years after the initial course, another assessment was made. A further review was conducted after 10 or more years. After the initial course there was little change in the KDS. 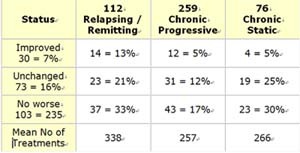 However,25% of Relapsing/Remitting patients improved on their value, while 64-77% of symptoms improved (Table II). Table II. Patients assessment of their response to the initial course. Other improvements that significantly affect the quality of life were gained during the course, many of which were retained with regular treatment in 73% of patients after 4 years. Subjective relief of bladder symptoms were confirmed by recording urinary frequency (Table III). Table III. Urinary frequency of 703 patients -before and after the initial course. Some patients complained that their symptoms were made worse - fatigue 20%, leg weakness 5%, visual disturbance 3% and limb numbness 1%, but were only short lived. Minor problems with pressure on the eardrums occurred in 17%, but did not necessitate stopping treatment. Many patients lost their improvements within a week or two. Four hundred and sixty-four patients (66%) who completed the initial course continued with treatment for at least three years as they found that their condition was stabilised, or the previous rate of deterioration retarded. On the other hand, 239 patients (34%) abandoned the treatment at intervals. Of these 25 later returned. Thirty six patients (7 Relapsing/Remitting, 24 Chronic progressive and 5 Chronic static) did not have any further treatment and after 6 years, 24 (67%) had deteriorated by a mean of 1.8 on the Kurtzke scale. The rate of deterioration was related to the frequency of treatment. As might be expected, patients in the early stages of the disease (Relapsing/Remitting) did best as there is less irreversible damage in the nervous tissue. None of these (mean initial KDS 2.3) who had received at least eight treatments in every quarter over 6 years had deteriorated. Indeed, four had actually improved by a mean of 0.8 on the Kurtzke scale. Figure 2. 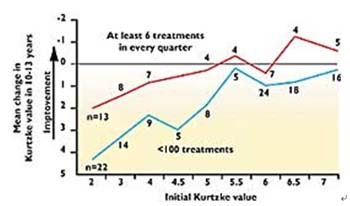 The change In Kurtzke value related to the number of treatments In 10 -13 years. A third survey was conducted after 10 - 13 years. By then 126 patients had died (8% were over 60 years old when first treated), 99 were lost to follow up, 29 had suffered injuries that affected their Kurtzke value and two had their diagnosis revised. Therefore 447 remained for analysis. The extent of deterioration clearly depends on the frequency and duration of treatment (Figure 2). Thirty eight of these patients had received less than 10 follow-on treatments and had deteriorated by 3.18 on the KDS. lt is therefore evident that with an adequate dosage, progressive deterioration can be retarded. Table IV shows that 23% of the patients remaining eligible for assessment were no worse after regular treatment over 10 - 13 years. Even more remarkable are the 30 patients (7%) of patients who have actually improved. An analysis reveals that over 300 treatments (about one treatment a fortnight over 10- 13 years are required to appreciably arrest progression and that more than 500 (say, once a week) are most effective. Those patients with a low initial Kurtzke value do best (Figure 3). Figure 3. Patients who received at least 6 treatments in every quarter venus those with less than 100. The natural history of MS is well established. Although there is a wide variation in the rate and pattern of decline, the majority of patients deteriorate over a two year period of observation. In this series the Relapsing/Remitting patients who had less than two follow-on treatments had deteriorated by 2.0 on the KDS after 10+ years, while the 31 who received more than 400 had only deteriorated by 1.1 . This represents a difference of being able to walk without assistance and the need to use two sticks, or the ability to walk 200 yards and being confined to a wheel chair. The Centres have attracted sufficient numbers of patients to allow assessment of the effect of different dosage on different stages of the disease. As might be expected, the response is better in patients with less advanced disease. The treatment has been shown to be safe, practicable, cost-effective and without side effects. After 10 or more years 38% of the 447 patients were still attending regularly. The findings imply that treatment with high-dosage oxygen should be instigated as soon as the condition is diagnosed and before irreversible lesions have become established. The evidence suggests that treatment should be given every a week and may possibly have to be continued indefinitely.